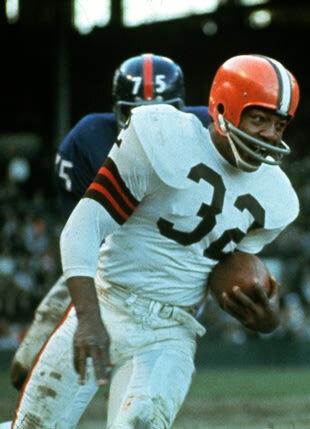 Jim Brown, perhaps the greatest running back in NFL history, did not win a Heisman. Winning the Heisman Trophy is a tremendous honor. It may be the most important individual award in sports — certainly at the collegiate level. Yet it hardly guarantees a seat at the NFL head table. Consider this — what do Jimmy Brown, Joe Montana, below right, Johnny Unitas, Walter Payton and Peyton Manning have in common? None of them won a Heisman Trophy. Neither did Jerry Rice or Lawrence Taylor or Reggie White. All of them are listed in the top 10 of the NFL Network’s 100 greatest players in NFL history, a list compiled by a blue ribbon panel of current and former NFL coaches, players, executives, and media. A total of 19 Heisman winners were the first pick in the NFL draft, including the first winner — halfback Jack Berwanger of the University of Chicago, the first player to be drafted by the NFL in its inaugural draft in 1936. Traded from the Eagles to the Bears, Berwanger opted not to sign in order to preserver his amateur status and compete for a spot on the US Olympic team in the decathlon. And since 1986, only three Heisman Trophy winners were number one picks in the NFL draft — Carson Palmer of USC in 2002, Sam Bradford of Oklahoma in 2008 and Cam Newton of Aubun in 2010. 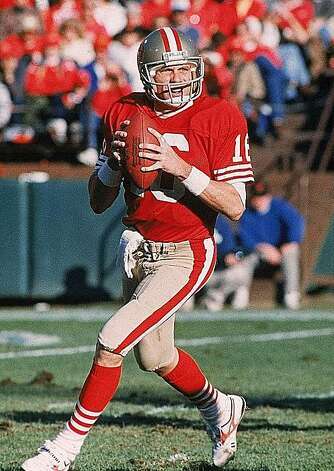 Only three Super Bowl MVPs were Heisman winners — Staubach, Allen and Jim Plunkett, the only quarterback to start and win two Super Bowls and not make the Pro Football Hall of Fame. Perhaps one day recent Heisman winners like Cam Newton (Auburn, 2010) and Robert Griffin III (Baylor 2011) will gain NFL immortality. And this year’s winner, Johnny Manziel (Johnny Football) from Texas A&M, is just a freshman. But it’s still way too early to make that call.